Here is another ad from the October 1958 Seventeen magazine. What girl wouldn't want to wear this to all her holiday dances and parties? Jonathan Logan is a favorite label of mine. I find his dresses quite frequently, which leads me to believe that his dresses were considered special enough to save for years. The ad copy says, "Pure enchantment...in pure silk faille. The demure back-buttoned jacket hides a decolletee dress that swoops out prettily from a tiny waist. Green, blue, black, red. 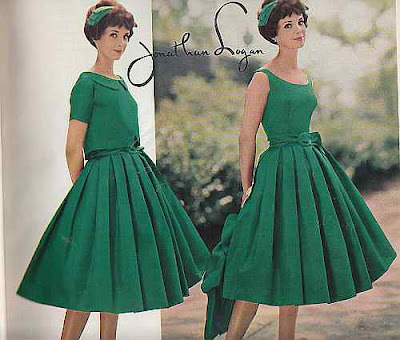 $29.95" The ad also states that the dress was available at Lord & Taylor, so you know this was a high quality label in the 50's. $29.95 in 1958 equates to about $225 today. The model is wearing a matching bandeaux hat with a green bow on the top of the head. The dress has a matching sash type belt with a large round fabric covered buckle. The waist length bolero jacket has a V notch at the front hem and a Peter Pan collar. It buttons up the back. The model is wearing black patent kitten heels in the original photo. And I'm sure there is a stiff crinoline under that dress, although it is not overly full so the pleats hold their shape. I think I've sold this dress in black before. I wish I could find it again. 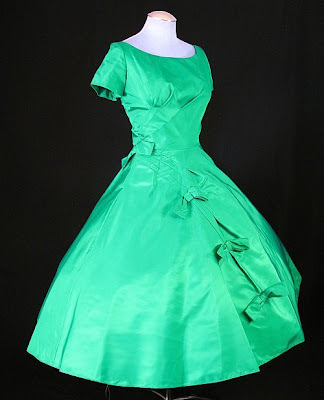 But you can get the look with this emerald green party dress available at www.coutureallure.com. What is a Trench Coat?